Nice work Michael. The troops are awaiting your inspection. I'd like to take credit for this beautiful armour but I can't. I'd like to thank Joey Kwan from the Golden Gate Garrison in the USA for allowing me to purchase Cody. If the armour looks familiar, it should, it's THE armour in the CRL photos. I'll be putting him to work in Central Queensland, if he's half as popular as Rex with the kids I'll be happy. 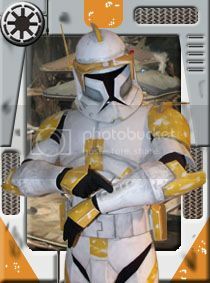 was good to have both Phases of Cody and Rex at DW, not sure if we got a pic together..
Looks absolutely awesome and suits you too! Great stuff Angelman, you will be a huge hit up north with your great trooping skills! That's a great set of armor there Angelman, I'm sure you wear it proudly. Current time: Tuesday 23-Apr-2019, 05:18 PM Powered By MyBB, © 2002-2019 MyBB Group.